When the end arrives, how far will you go to save the ones you love? The Critically Acclaimed Darkness Rising Series, Now in One Complete Edition! Darkness Rising is an epic survival/thriller post-apocalyptic series that asks the "what if" question that lurks in the back of everyone's mind. When a terrorist plot results in the detonation of several nuclear devices across the West Coast, the Frasers are thrown into disarray and their strained familial relationships are tested as they watch society collapse around them. Tens of millions of people are killed, injured and driven away from their homes as the result of a sinister plot that the government and its citizens are struggling to understand. With their older daughter lost in the chaos, the Frasers must somehow pull together to support each other and fight to reunite their family. Darkness Rising is a thrilling post-apocalyptic series that follows the survivors of a massive terrorist attack that isn't quite what it seems. As you learn more about the Fraser family and a few brave government agents who are attempting to unravel the horror and mystery behind the attacks, you'll soon discover that not everything in the apocalypse is as it appears to be. 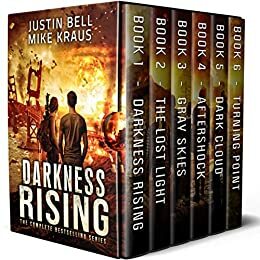 Written as a collaboration between Justin Bell and #1 bestselling post-apocalyptic author Mike Kraus, Darkness Rising is a gripping, unique and timely take on the post-apocalyptic genre, and is one that will leave you breathless with every turn of the page. This complete edition of Darkness Rising features all six books in the series, each one full of action, suspense and drama as the Fraser family struggles to survive the end of days. I have enjoyed this series from beginning to the end , the highs and lows of a family struggling to come to terms with the devastation caused by terrorists from both home and another country. 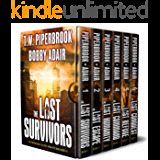 The Frasers family & friends fighting to cross a devastated land fighting home growen military groups and running from nuclear fallout, to find friends and family missing ,and try to stop more nuclear bombs from being detonated. 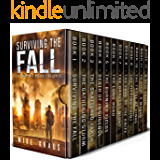 A grand post-apocalyptic story that drags the reader right into the middle of what the characters are experiencing. Brilliantly written, thrilling, suspenseful. An uplifting read in the sense that ordinary people can reach within themselves and find the resilience, the heroic to endure and protect those they love. It goes for all of us too – that until we are tested we do not know how capable we are. 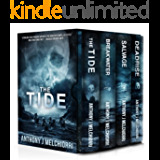 The mystery behind the attack unravels to show that the apocalypse is not exactly orchestrated as it first seems. Gripping, enjoyed to the end. It was hard to put down. Looking forward to the next series of books by these writers. I was excited to read this collection, because I'm drawn to these type of books. But just a few pages into the first book, the profanity started. Then it progressed to using God's name in a "not-reverent" manner. I am a Christian and don't want to read this type of language, let alone have to pay for it. I was assured by the author himself by email that he strives to not include any profanity or the like in his books. Very disappointed. I have already deleted it from my Kindle library. "Right-wing" militias acting as North Korean proxies to blow up America. Only in the fevered dreams of the Left. 99 cents? Save your money. What is so amazing and incredible about Darkness Rising? The storytelling, character development, dialogue, plot thickening, descriptions, action scenes and even the "novella" / boxed set style, which was new to me. Everything was so "Five Star" that it's hard to say what was best about Darkness Rising. If I absolutely had to make a choice, I guess it would be character development. I got to know everybody and how and why they responded to whatever was going on. As a fairly well-read consumer of post-apocalyptic and thriller books, I found this one refreshingly different in its plot. It was like reading about real people, not just names in a book. As I result of Darkness Rising, I have purchased two other sets of Mike Kraus books and am excited to have found an exceptionally gifted new-to-me author. I haven't looked into coauthor Justin Bell, but I will. These two men made a great team with Darknesss Rising! Thanks, guys! 1.0 out of 5 starsYou get what you pay for. The header tells the whole story. The plot was ok but too contrived; but the worst was that the authors couldn't be bothered to tell the story in an accurate manner. Errors of fact regarding firearms, vehicles, maps and the interstate system, use of the incorrect homonyms and, at times, a character on one page became a different character on the next. If you don't care about any of this, you might enjoy the series...and, no, I'm not a frustrated English teacher but a self-employed auto mechanic who tries to give his customers top quality results and expects the same from people in other fields of endeavor. 5.0 out of 5 starsFairly fast paced. Something about this app and seeing the page areas to annotate comments, well, sheesh. But if a person hasn't been immersed in a technical field such as weapons, it can be an easy mistake. Still, your proofreaders should catch such things or you should consult a professional if your knowledge is lacking. But, all in all, this has been a decent read and I recommend it.